What is Saint Bonaventura the patron of? Who or what is Saint Bonaventura the patron saint of? Saint Bonaventura is the patron of Bowel disorders. Meanings, definition and origins - a patron is considered to be a defender of a specific group of people or of a nation. There is a patron for virtually every cause, profession or special interest. Prayers are considered more likely to be answered by asking a patron for intercession on their behalf. The story and history of Saint Bonaventura. Bonaventure suffered from a life threatening sickness effecting the bowels when he was a child. The prayers of Saint Francis of Assisi saved his life. He studied philosophy in France and became a doctor of theology and in 1587 he was ranked as one of the greatest doctors of the church by the Franciscan Pope Sixtus V.
There are two categories of saints: martyrs and confessors. A Christian martyr is regarded as one who is put to death for his Christian faith or convictions. Confessors are people who died natural deaths. 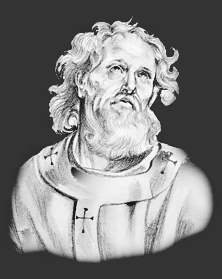 Date of Death: Saint Bonaventura died in A.D. 1274. Cause of Death: Natural Causes. Why is Saint Bonaventura the patron of Bowel disorders? Why is Saint Bonaventura is the patron of Bowel disorders? It is believed that this type of illness was associated with Binoface when he was a child. It is helpful to be able to recognise Saint Bonaventura in paintings, stained glass windows, illuminated manuscripts, architecture and other forms of Christian art. The artistic representations reflect the life or death of saints, or an aspect of life with which the person is most closely associated. Saint Bonaventura is represented in Christian Art with his cardinal's hat lying at his feet or hanging on the bough of a tree. This is because when the two nuncios of Pope Gregory IX. brought him the red hat, they found him in the convent garden washing the plate from which he had just dined, and he requested them to put it down on the ground, or leave it hanging on a tree, until he could take it in his hands. His attributes are a book, on account of his great learning, and the Sacramental cup, from the incident related in the legend, that since he considered himself unworthy to receive the Sacrament, it was presented to him by an angel. The Feast Day of Saint Bonaventura is July 14th. The origin of Feast Days: most saints have specially designated feast days and are associated with a specific day of the year and these are referred to as the saint's feast day. The feast days first arose from the very early Christian custom of the annual commemoration of martyrs on the dates of their deaths at the same time celebrating their birth into heaven.